Just under a week left for the Big Day, yup, St. Patrick's Day. And with that, we're proud to bring you a unique blog today: one that won't link you to any product on WorldSoccerShop that you can buy or pre-order. The reason is, for once, we're allowed to show images of a jersey launch, but not yet sell the jersey. 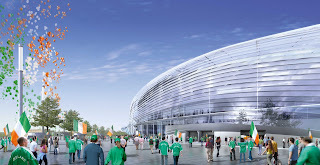 I didn't understand it either, but let's roll with it, and enjoy some of the images provided by Umbro and the Ireland National Football Team, including the new away jersey - plus details on the new Ireland retail store - while plans for a US online store are progressing nicely. 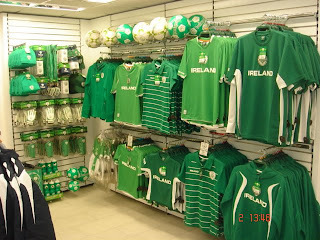 Umbro Ireland in conjunction with the FAI and Carroll’s Irish Gift Stores has opened the first UMBRO IRELAND SUPPORTERS STORE. The store opened its doors for business on Saturday morning at 9am and despite it being a hectic 6 Nations (rugby) weekend it had a very successful “soft opening”. The store is a 1,200 sq ft space in Carroll’s Irish Gift store on Westmorland Street in Dublin City centre. This will be the first location where 100% of the FAI Umbro product will be available under one roof. 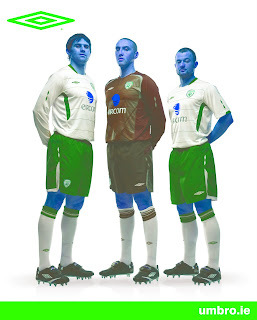 March promises to be a busy month for the store with the launch of the New Ireland AWAY KIT (MARCH 20th) that will be worn against Italy in the World Cup 2010 qualifier in Bari on April 1st. About 65% of the product is FAI, 25% is Umbro product (including International, Premier League, League of Ireland and European Umbro sponsored teams kits) and 10% will be Score draw ( an official retro company dealing with such clubs and associations as Man Utd, Arsenal, Chelsea, Celtic, Man City, Everton, West Ham, Newcastle, Aston Villa, FAI, SFA, IFA etc etc www.scoredraw.com ). The store will also feature a high quality FAI Giftware collection from mid summer 09, this will include, key-rings, mugs, pens, autograph books etc. The store has been opened for and is focused on the fantastic Irish Football Supporters; in-store music and video related to the Irish national team are playing to help create a suitable stadium atmosphere. The official opening will be the week of the Ireland V Bulgaria game when we hope to have Irish International team manager Giovanni Trapattoni and some of the Irish players attend a signing session in the store. We also hope to build national media coverage (TV, Radio, Print) week commencing 23rd March. The store will be open 7 days a week and will soon have a full front facing FAI window display on Westmorland Street. Umbro currently has over 1,200 owned and operated stores worldwide. This is Umbro Ireland’s (Toplion Sportswear) first step into retail in Ireland and it will be quickly followed by the second Umbro Store which will be situated at Shamrock Rovers new stadium in Tallaght. This store is currently under construction and will hopefully be open for Shamrock Rovers first home game on March 13th. The store will be Shamrock Rovers official supporters store and it will also carry the wider range of Umbro product ( including team-wear for local teams www.umbro.ie ) as with the FAI Supporters Store. Please drop into either store at your convenience and let us know what you think.